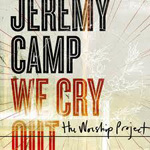 Grammy®-nominated and RIAA® multi-Gold® selling artist Jeremy Camp is set to release his seventh studio project, We Cry Out: The Worship Project. Once again Camp teamed up with award-winning producer Brown Bannister to create a heartfelt, worshipful project. Returning to his worship music roots, he co-wrote with other notable worship leaders Matt Maher, Reuben Morgan (Hillsong) and Brenton Brown. The album features hits such as "Mighty To Save", "You Never Let Go" and more. "It is an overwhelming joy to see how the Lord has been faithful even though I am undeserving of it," shared Camp thinking back on his career. "I just want to continue to seek Him in all that I do, and want to always remember that it's the Lord doing the work... not me!" With his ability to compose hit songs and capture audiences of all ages, Camp has sold more than three million records. In 2010, he received his 19th career no. 1 radio hit. Other accolades to his name include, two American Music Award nominations, three ASCAP Christian Music Awards "Songwriter of the Year" including "Song of the Year" and multiple Dove-nominations and five awards. In addition, Camp ended the decade with Billboard recognition as the no. 3 Christian Artist of the Decade. Camp also had five songs in the Billboard Top 50 Christian Songs of the Decade. Camp recently received his fourth RIAA® Gold® album certification for Beyond Measure.